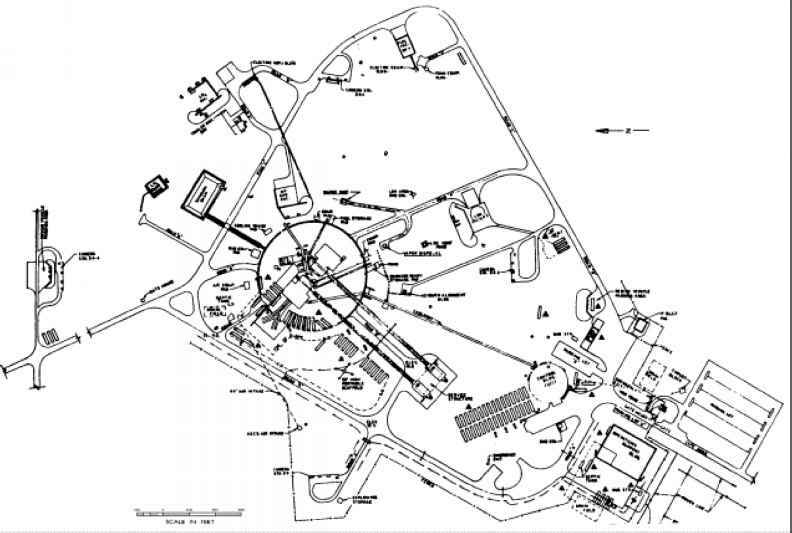 The qualification test of a spacecraft is a lengthy and demanding process. Besides proving the design, it may also be the first chance to evaluate the entire spacecraft in operation. Some parts of the qualification test may provide data to validate the engineering design and verify proper interaction of the equipment. Assembling the first unit is particularly difficult because components are seldom available in the best sequence and unexpected interference and test peculiarities always occur. All operations must be planned and executed under control and quality surveillance. Records must be maintained and the results of each integration and test step reviewed before proceeding to the next operation. Typically, tests to qualify a spacecraft last more than a year. Spacecraft integration normally starts with delivery of an assembled structure or structural frame. Liquid propulsion parts are assembled to the structure first because the fields used to braze them together are not compatible with electronic components. The spacecraft wiring harness can go on before or after the propulsion components. Electronic assembly of the spacecraft commonly starts with electric power and command and data handling subsystem components. Integration of the remaining subsystems depends more on the particular design. 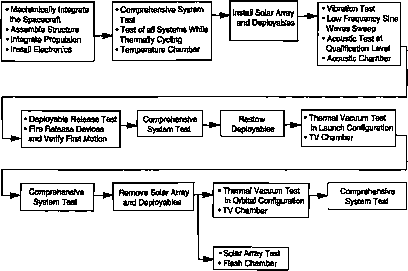 Although the subsystems may have been preassembled and functionally tested, it is more common to integrate components one at a time and test the subsystems after they are integrated on the spacecraft. To test a spacecraft, a crew normally uses central control and display equipment, with a computer for command generation, telemetry decoding, logging, display, and automated test sequences. They operate the equipment by keyboard and monitor status by video displays. These displays typically consist of an event screen that shows all signal activity and page displays devoted to particular subsystem parameters. The test set also provides stimuli and data-measurement equipment for end-to-end testing of the spacecraft and payload subsystems. A complete spacecraft test may take several days to run and involve subroutines for each subsystem or functional group. Such a test is called an integrated system test (1ST) or a comprehensive system test (CST). It uses subroutines that test each subsystem, so we need to rerun only the subroutine for a subsystem anomaly. We may also use a short version of this functional test at selected points in the integration flow. Fig. 12-5. Typical Row of Qualification Test. Note that system tests are performed after each major activity. During the qualification sequence, the test crew records all anomalies or out-of-tolerance measurements and formally resolves each discrepancy. Anomalies which result from operator error or malfunctioning test equipment and which do not damage the spacecraft are easy to resolve. But spacecraft malfunctions demand thorough investigation. If design errors have caused the problems, the design must be corrected and retested. Test rules normally require rerun of an integrated system test (or all affected subroutines) if any electrical, pneumatic, or hydraulic lines are disconnected.